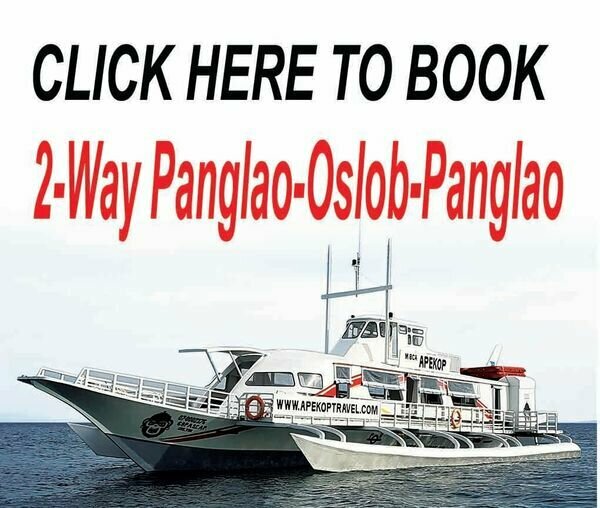 This return ticket is perfect for those, located in Panglao, who want to pay a vist to the famous whale-shark watching. For a price that hardly exceeds that of the one-way ticket we offer you the possibility to experience this unforgettable experience. We have a free pickup from "Rona's Corner" opposite McDonalds in the centre of Alona on 05:30 AM that will bring you to our departure location: Panglao MOMO BEACH (from Panglao Circumferential Road take LOOC (Elementary school, Mario's Resort entrance), after 1300 m. straight you reach the beach) Boarding from 05:30 AM, departing at 06.30 AM. Returning from Oslob later the same morning at 11.30 AM. It allows you enough time to visit the whaleshark reserve and be back in time for the return fare. Please note that this ticket involves only the sea fare. Other costs as transfer from our arrival destination to the whaleshark reserve (around 150 PHP) and entrance fees (around 1000 PHP) have to be paid additional locally.